MOSCOW- Russian Communists urged Saturday the Communist parties of ex-Soviet states to join their efforts to restore the former Soviet Union. Communist leaders from Russia, Belarus, Ukraine, Armenia and other ex-Soviet republics gathered Saturday in the Russian capital to discuss the strengthening of future cooperation and the development of a common strategy to re-unite the former members of the now-defunct Soviet Union. "We believe that the restoration of a broken union [between ex-Soviet republics] is our key goal, and we will continue our efforts to accomplish this [the restoration] task," Russian Communist Party leader Gennady Zyuganov said during a plenary meeting of the Council of the Union of Communist Parties of ex-Soviet states. The participants of the meeting issued a statement calling upon all parties on the territory of the former Soviet Union that adhere to Communist ideology to join the fight for the "socialist development of brotherly nations and their unification into a Union State." "Without a union between Russia, Ukraine, Belarus and other brotherly republics that used to be members of the Soviet Union, we do not have a future," Zyuganov said. With people like Oleg Shenin rooting for it, don't be surprised if that turned out to be the truth. What you are saying is true, but it is a bit more complicated. Russia, or at least the government is quite content right now with their ability to make money from their natural resources. The people however of the former USSR have indeed expressed a great desire to make some kind of an economic union together and perhaps even recreate a "brotherhood" group, as you said. The difference lies in one specific place: All of these countries now wish to participate in that union as individual sovereign nations rather than as components of Russia. This idea includes Russia who, with their vast land and valuable gas and oil fields, frankly has told everyone to go jump in the lake. Again, this thinking does not reflect necessarily the Russian public, who are living from perhaps $150 - $250 a month, but rather the Russian ruling elite. These high ups seem only to be interested in firing up the cold war. I see you live in Belarus Adam. Must be a fascinating place. I think the Soviet Union will return, but based on a looser federalised structure. Well, unfortunately it seems as though they are only coming back insofar as a cold war missile crisis is concerned. 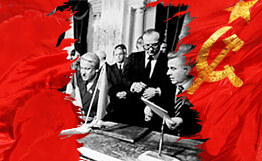 The people of the former USSR very much want to recreate a new "brotherhood pact". I would love to see this too. I am one who believes that the world was better when there was an alternative thought to unchecked capitalism. And I am not alone. The problem is that the west controls most of the money and the resources. This and the necessity to exploit all potential resources for the present has made the shark hunt threatening to the whole planet. I think a little more socialism, or at least a bit more social thought is the answer for all of the earth's evils. But frankly, you know, I don’t have much hope. But then again, I am living in Belarus and we are no known to be the most optimistic people in the world.